The central warehouse of Kruidvat in The Netherlands is highly automated and equipped with sophisticated technology. 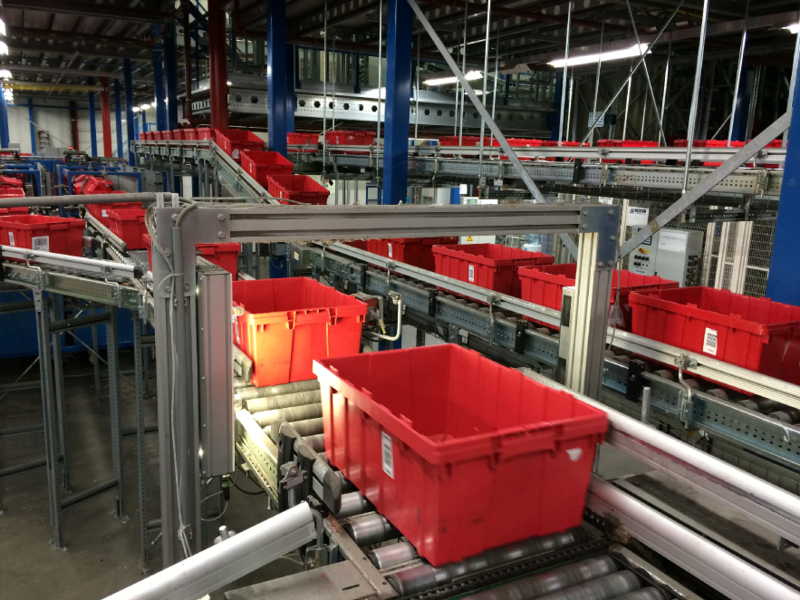 Robots are moving bins from the warehouse positions to the correct order pick positions. This line is now equipped with vision-supported sensors for collision avoidance. This can cause unnecessary wear on the robot. Each triggered emergency stop causes delay since a warehouse employee has to localize the issue and correct the problem. A difficult and unsafe job. To prevent delays and any human intervention in the automated logistics, each bin needs to be checked. Typically a job for an automated station. This integrated vision inspectie-system checks each passing bin automatically for known deviation-types. A bin which doesn’t meet all requirements is re-routed to a manual inspection. After correction it is re-submitted to the beginning of the line and will safely enter the automated logistic flow. The vision inspectie systeem developed by Beltech is integrated into an existing roller conveyer which transports the bins from the supply position to the warehouse position. To minimize the impact of the overall process, the inspection is executed without the need to stop the bins, wo without additional cycle time.When the bin passes by, 2 camera’s take images from the front side and the back side of the bin. Any obstacle that protrudes 5 mm or more is detected by the system. In case of a detected obstacle, the vision system initiates a signal to the line control and the bin is pushed out at a place where it has to be cleaned. When the bin is cleaned or adjusted, it is re-entered into the process again. Beltech built this system based on a proof-of-concept demo system at the Beltech Vision lab. Based upon observations during site visits at Kruidvat, in the lab a simplistic model and conveyer set-up was created to simulate the Kruidvat environment. With actual used bins, the system was tested and light-optics an camera set-up was designed. Extensive software development was required to make the system reliable, consistent and capable of processing all possible deviations.In the actual production environment of the customer, the system was installed, commissioned and integrated where the final acceptance period started. As the system architecture was designed in a solid manner, the final adjustments during this final phae could be done merely remotely and in primarily software to ensure the system worked according to the customer’s needs. Also future changes to the bins, new deviations or customer requirements can leverage the existing architecture and be addressed largely by adjusting the current Beltech software.In many cases, the customer can adapt settings of the system by itself through the delivered user interface making them highly flexible.